Now in its fourth year, The Open West prize, brainchild of curators Lynn Coleman and Sarah Goodwin, have expanded the remit of its exhibition from the Cheltenham Art College’s campus to the challenges and possibilities of Gloucester Cathedral – presenting a wide-ranging variety of some 90 works by 55 artists. Intriguingly, what drew my attention on first entering the Cathedral’s nave from all the possible works, was the play of multi-coloured light projected onto the surface of the limestone columns that still bear the remnants of its medieval polychromy. Yet this was no installation of artificial lights positioned outside the Cathedral’s stained glass windows to cast the beautiful patterns – but in fact the brilliant effect of the low vernal sun flooding into the church. Nevertheless, this phenomenon effectively set the tone for enjoying the art works to follow. For there was an overriding sense of playfulness and contingency to the dotting of pieces in every nook and cranny of the ancient building. For example, Diana Taylor’s From Time to Time, 2011, wooden slats stencilled and painted with floral patterning perfectly echoed – with a cheeky irreverence – the garish interior of a little side chapel whose steps they haphazardly tumbled down. Likewise the adjacent installation – Gurmit Kaur’s immersive Inside Out –Umbilical Cord, 2010, an environment glowing with a kind of gold lamé reminiscent of a night club, contained a huge twisting tubular form – teasing out an exoticism that one experiences in more Byzantine churches such as St Marks in Venice. Intrigued by this unfamiliar piquancy in what can, on occasion, feel like little more than a dull museum, I continued to explore the Cathedral’s corners with a renewed fascination – spurred on by the fact that the work in the show forms a kind of miscellanea, an assortment of approaches. Actually I began to gain a real sense of pleasure and lightness of the place, lifting it from its formerly leaden if not morose state into neo-fun house of surprising encounters and experiences. For instance, in the Lady Chapel, and behind the bars of the wrought iron gate to a tomb, lay one of Tracey Snape’s glowing noble gases captured in glass tubing -shaped like the branching of plant roots or branches and entitled Chasing the Shadows, 2011. 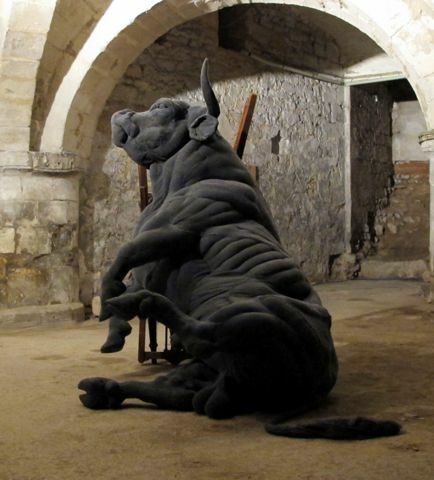 Or, downstairs in the crypt, the rather touching Dorcas Casey sculpture, Bull, 2011, lay like an immobilised minotaur crafted roughly in a grey jersey fabric filled with stuffing and lashed to a pile of old institutional chairs. Even where the works were compromised, as was the case in the cloisters – where the 2D work was displayed with hanging system of batons wedged between pillars to avoid damaging fixings – there was an experimental spirit that was ultimately beneficial to the show and the place. As such, there occurred combinations of artwork and context that would not have been so resonant had it not been for the openness to potential failure. One such example was Oliver Marsden’s Ohm Halo I, 2012, its connotations of Buddhist meditation made markedly richer by its home in the nave to the right of the west window. Also, some deeply vital experience was suggested in witnessing Emma Critchley’s video Shared Breath, 2011; free divers receiving essential oxygen mouth-to-mouth within the charged atmosphere of the Cathedral. For me, however, it was Hans Diernberger’s little self-contained environment Crescendos and Nothing, 2010, in a vault off the corridors of the cloisters that proved most engaging. Projected against the back wall of the darkened room full of small rectangular mirrors on metal stalks – what started as a bright, bouncing, ‘pacman’-like shape – turned out to be a photographic image of a tunnel entrance moving closer as the filming subject walked towards it. This pleasantly disconcerting volte-face of perception seemed to propose fluidity between the graphic sign and the metaphorical or poetic image. What the Open West and Gloucester Cathedral achieved in its 2012 show is that – through openness and willingness to share risk to the authority which accompanies fixed and secure identities of both gallery and place of worship – a richer viewing experience was presented to the visitor, whether tourist or art-going public. One could suggest that such attunement to our imperfection connects (umbilically, if you like) art and religion – in the sense that in being comfortable with our unfinished state we allow ourselves to continue to learn, develop and grow.